New Arthroplasty Today App Launches! 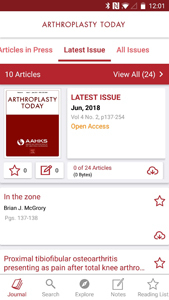 AAHKS and Elsevier are pleased to announce the launch of the Arthroplasty Today mobile app. Read the current issue, search the archives of PubMed-indexed articles, take notes and create your own reading list. Download the free app from the Apple App Store for iPhone or Google Play for Android.